Our Brentwood office offers Zygomatic Implants as a more comfortable solution for patients who experience the most extreme form of bone loss in their upper jaw. For those suffering from maxillary bone loss and cannot be treated with a traditional implant surgery, this procedure offers an alternative solution to block bone grafting and sinus lift bone grafting, which typically requires taking bone from other parts of the mouth to support the implant. Traditionally, bone grafts were the only solution to provide the adequate bone structure required to sustain conventional implants. Specifically when bone density was lacking in the upper jaw, the process of bone grafting was time consuming, painful and costly. 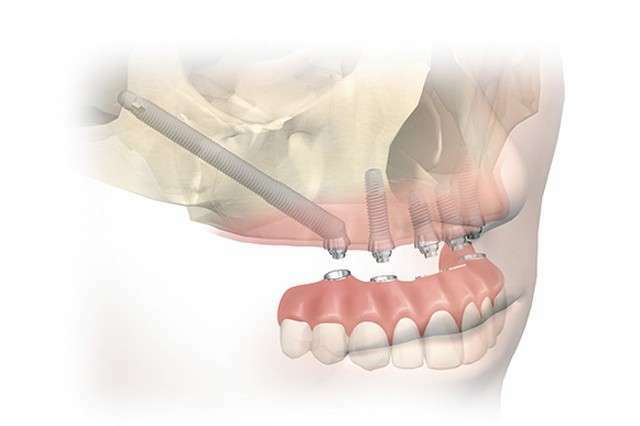 In addition to a bone graft, the procedure often times required a sinus lift as well before the traditional implants and permanent fixed arch could be placed. However with the development of Zygomatic Implants, periodontists can now perform implant procedures more efficiently, cost-effectively and comfortably for patients. Unlike classic implants which are drilled directly into the mouth, these extra-long implants are rooted in upper jaw bone, closest to the zygomatic or cheek bone, and provides a secure foundation to support the implant. 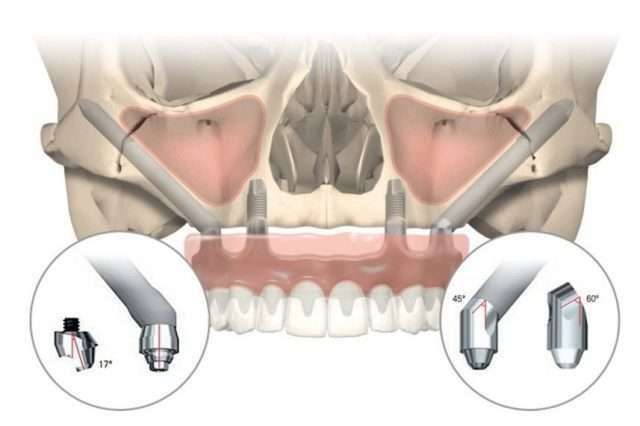 1-2 extended implants are anchored on each side of the mouth near the cheekbone, along with an additional 2-4 regular implants that are placed in the front of the mouth, to sustain the new front teeth. The additional support is imperative in sustaining the longevity of dental implants in patients with bone loss as their upper jaw bone is usually very weak. The recovery time is four months, and once the mouth heals, the permanent crowns can be put into place for a set of fully functional teeth. A minimally invasive procedure means more comfort and shorter recovery times. Because the majority of patients will not require a bone graft, the procedure is less painful than traditional implant procedures and has quicker healing times. Immediate results. Patients leave with fully functioning teeth that are attached to the implant on the day of the procedure. Graftless procedure eliminates need for painful and invasive block bone grafting and sinus lift bone grafting. Optimizes the time needed to achieve complete upper jaw restoration. The strength and length of the implants allow for placement in upper jaw. A single extra-long zygomatic dental implant is the equivalent of 3-4 regular dental implants. Painless procedure performed under IV sedation while patient is asleep. Cost effective alternative to traditional dental implants. Can be inserted as Double Zygomatic implants or “quad zygomatics” on each side of the upper jaw, shortening the healing time as compared to bone grafting. Necessary tooth extractions, Zygomatic Implants and the permanent fixed bridge can be completed in the same visit.